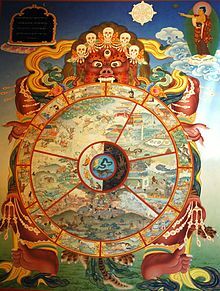 Saṃsāra (Sanskrit, Pali; also samsara) in Buddhism is the beginningless cycle of repeated birth, mundane existence and dying again. Samsara is considered to be dukkha, unsatisfactory and painful, perpetuated by desire and avidya (ignorance), and the resulting karma. In Buddhism, saṃsāra is the "suffering-laden, continuous cycle of life, death, and rebirth, without beginning or end". In several suttas of the Samyutta Nikaya's chapter XV in particular it's said "From an inconstruable beginning comes transmigration. A beginning point is not evident, though beings hindered by ignorance and fettered by craving are transmigrating & wandering on". It is the never ending repetitive cycle of birth and death, in six realms of reality (gati, domains of existence), wandering from one life to another life with no particular direction or purpose. [note 3] Samsara is characterized by dukkha ("unsatisfactory," "painful"). [note 4] Every rebirth is temporary and impermanent. In each rebirth one is born and dies, to be reborn elsewhere in accordance with one's own karma. It is perpetuated by one's avidya ("ignorance"), particularly about anicca and anatta, and from craving. [note 5] Samsara continues until moksha is attained by means of insight and nirvana. [note 2] the "blowing out" of the desires and the gaining of true insight into impermanence and non-self reality. Gods realm: the gods (devas) is the most pleasure-filled among six realms, and typically subdivided into twenty six sub-realms. A rebirth in this heavenly realm is believed to be from very good karma accumulation. A Deva does not need to work, and is able to enjoy in the heavenly realm all pleasures found on earth. However, the pleasures of this realm lead to attachment (Upādāna ), lack of spiritual pursuits and therefore no nirvana. The vast majority of Buddhist lay people, states Kevin Trainor, have historically pursued Buddhist rituals and practices motivated with rebirth into Deva realm. [note 6] The Deva realm in Buddhist practice in southeast and east Asia, states Keown, include gods found in Hindu traditions such as Indra and Brahma, and concepts in Hindu cosmology such as Mount Meru. Demi-god realm (Asura): the demi-gods (asuras) is the third realm of existence in Buddhism. Asura are notable for their anger and some supernormal powers. They fight with the Devas (gods), or trouble the Manusya (humans) through illnesses and natural disasters. They accumulate karma, and are reborn. Demi-god is sometimes ranked as one of the evil realms as there are stories of them fighting against the Gods. Hungry ghost realm: hungry ghosts and other restless spirits (preta) are rebirths caused by karma of excessive craving and attachments. They do not have a body, are invisible and constitute only "subtle matter" of a being. Buddhist texts describe them as beings who are extremely thirsty and hungry, very small mouths but very large stomachs. Buddhist traditions in Asia attempt to care for them on ritual days every year, by leaving food and drinks in open, to feed any hungry ghosts nearby. When their bad karma demerit runs out, these beings are reborn into another realm. According to McClelland, this realm is the mildest of the three evil realms. According to Yangsi Rinpoche, in contrast, the suffering of the beings born in the realm of the hungry ghosts is far more intense than those born in the animal realm. Inconsistencies in the oldest texts show that the Buddhist teachings on craving and ignorance, and the means to attain liberation, evolved, either during the lifetime of the Buddha, or thereafter. [note 10] According to Frauwallner, the Buddhist texts show a shift in the explanation of the root cause of samsara. Originally craving was considered to be the root cause of samsara,[note 11] which could be stilled by the practice of dhyana, leading to a calm of mind which according to Vetter is the liberation which is being sought. ^ Other scholars note that better rebirth, not nirvana, has been the primary focus of a vast majority of lay Buddhists. This they attempt through merit accumulation and good karma. ^ Aṅguttara Nikāya III.415: "It is "intention" that I call karma; having formed the intention, one performs acts (karma) by body, speech and mind. ^ Padmasambhava: "If you want to know your past life, look into your present condition; if you want to know your future life, look at your present actions." ^ Frauwallner (1953), as referenced by Vetter (1988), Flores (2009), and Williams, Tribe and Wynne (2012). ^ Tillmann Vetter: "Very likely the cause was the growing influence of a non-Buddhist spiritual environment·which claimed that one can be released only by some truth or higher knowledge. In addition, the alternative (and perhaps sometimes competing) method of discriminating insight (fully established after the introduction of the four noble truths) seemed to conform so well to this claim." ^ In the Nikayas the four truths are given as the "liberating insight" which constituted the awakening, or "enlightenment" of the Buddha. When he understood these truths, he was "enlightened," and liberated, as reflected in Majjhima Nikaya 26:42: "his taints are destroyed by his seeing with wisdom." Typically, the four truths refer here to the eightfold path as the means to gain liberation, while the attainment of insight in the four truths is portrayed as liberating in itself. ^ Phra Thepyanmongkol: "The designation that is Nibbana [Nirvana] is anatta (non-self)", states Buddha, in Parivara Vinayapitaka. ^ Chogyam Trungpa states: "In the Buddhist system of the six realms, the three higher realms are the god realm, the jealous-god realm, and the human realm; the three lower realms are the animal realm, the hungry ghost realmm, and the hell realm. These realms can refer to psychological states or to aspects of Buddhist cosmology." ^ a b Wilson 2010. ^ Juergensmeyer & Roof 2011, p. 271-272. ^ McClelland 2010, p. 172, 240. ^ Williams, Tribe & Wynne 2012, p. 18–19, chapter 1. ^ a b Buswell 2004, p. 711-712. ^ a b Buswell & Gimello 1992, p. 7–8, 83–84. ^ a b Choong 1999, p. 28–29, Quote: "Seeing (passati) the nature of things as impermanent leads to the removal of the view of self, and so to the realisation of nirvana.". ^ a b c Rahula 2014, p. 51-58. ^ Laumakis 2008, p. 97. ^ a b c Gethin 1998, p. 119. ^ a b Ajahn Sucitto 2010, pp. 37-38. ^ a b Keown 2000, Kindle locations 702-706. ^ a b Chogyam Trungpa 2009, p. 137. ^ a b Williams 2002, pp. 74-75. ^ a b c Keown 2004, pp. 81, 281. ^ a b c Fowler 1999, p. 39–42. ^ Smith & Novak 2009, Kindle Location 2574. ^ Trainor 2004, p. 62–63. ^ Conze 2013, p. 71. ^ Naomi Appleton (2014). Narrating Karma and Rebirth: Buddhist and Jain Multi-Life Stories. Cambridge University Press. pp. 76–89. ISBN 978-1-139-91640-0. [b] Brian Morris (2006). Religion and Anthropology: A Critical Introduction. Cambridge University Press. p. 51. ISBN 978-0-521-85241-8. , Quote: "(...) anatta is the doctrine of non-self, and is an extreme empiricist doctrine that holds that the notion of an unchanging permanent self is a fiction and has no reality. According to Buddhist doctrine, the individual person consists of five skandhas or heaps - the body, feelings, perceptions, impulses and consciousness. The belief in a self or soul, over these five skandhas, is illusory and the cause of suffering." ^ Bruce Mathews (1986). Ronald Wesley Neufeldt (ed.). Karma and Rebirth: Post Classical Developments. State University of New York Press. pp. 123–126. ISBN 978-0-87395-990-2. ^ James McDermott (1980). Wendy Doniger (ed.). Karma and Rebirth in Classical Indian Traditions. University of California Press. pp. 168–170. ISBN 978-0-520-03923-0. ^ Robert Buswell & Donald Lopez 2013, pp. 49-50, 708-709. ^ McClelland 2010, pp. 40, 107. ^ Bryan J. Cuevas; Jacqueline Ilyse Stone (2007). The Buddhist Dead: Practices, Discourses, Representations. University of Hawaii Press. pp. 118–119. ISBN 978-0-8248-3031-1. ^ a b Dalai Lama 1992, pp. 5-8. ^ a b Patrul Rinpoche 1998, pp. 61-99. ^ Keown 2013, pp. 35-40. ^ a b c d e f g h i j Trainor 2004, p. 62. ^ a b c d e f McClelland 2010, p. 136. ^ Keown 2013, p. 35. ^ Keown 2013, p. 37. ^ Keown 2013, pp. 37-38. ^ Keown 2013, pp. 36-37. ^ a b c Trainor 2004, p. 63. ^ a b c d Keown 2013, p. 36. ^ McClelland 2010, p. 114, 199. ^ Yangsi Rinpoche (2012). Practicing the Path: A Commentary on the Lamrim Chenmo. Wisdom Publications. p. 122. ISBN 978-0-86171-747-7. ^ a b Sogyal Rinpoche 2009, p. 97. ^ Rupert Gethin (1998). The Foundations of Buddhism. Oxford University Press. p. 120. ISBN 978-0-19-289223-2. ^ a b Vetter 1988, p. xxi. ^ Flores 2009, p. 63–65. ^ Williams, Tribe & Wynne 2012, p. 33-34. ^ a b Vetter 1988, p. xxi-xxxvii. ^ a b Bronkhorst 1993, p. 93-111. ^ Edelglass 2009, p. 3-4. ^ Laumakis 2008, p. 136. ^ Williams, Tribe & Wynne 2012, p. 46–47. ^ Gombrich 1997, p. 99-102. ^ Vetter 1988, p. xxxii, xxxiii. ^ a b Bronkhorst 1993, p. 54-55, 96, 99. ^ Vetter 1988, p. xxxiii. ^ Bronkhorst 1993, p. chapter 7. ^ Bronkhorst 1993, p. 108. ^ Bhikkhu Nanamoli (translator) 1995, p. 268. ^ Williams, Tribe & Wynne 2012, pp. 30–42. ^ Robert Buswell & Donald Lopez 2013, pp. 304-305. ^ Peter Harvey (2015). Steven M. Emmanuel (ed.). A Companion to Buddhist Philosophy. John Wiley & Sons. pp. 26–44. ISBN 978-1-119-14466-3. ^ Ted Honderich (2005). The Oxford Companion to Philosophy. Oxford University Press. pp. 113, 659. ISBN 978-0-19-103747-4. ^ Melford E. Spiro (1982). Buddhism and Society: A Great Tradition and Its Burmese Vicissitudes. University of California Press. p. 84. ISBN 978-0-520-04672-6. ^ Phra Thepyanmongkol (2012). A Study Guide for Right Practice of the Three Trainings. Wat Luang Phor Sodh. pp. 412–418. ISBN 978-974-401-378-1. ^ Peter Harvey (2015). Steven M. Emmanuel (ed.). A Companion to Buddhist Philosophy. John Wiley & Sons. pp. 36–37, Note: Harvey clarifies that non-Self does not mean "no-self", but denial of Self or "I" or 'I am' is clearly a vital soteriological idea in Buddhism. ISBN 978-1-119-14466-3. ^ a b Waldron 2003, p. 22. ^ Chogyam Trungpa 2009, p. 127. ^ Gethin 1998, pp. 119-120. ^ Gethin 1998, p. 121. ^ a b Williams 2002, pp. 78-79. ^ David L. McMahan (2008). The Making of Buddhist Modernism. Oxford University Press. pp. 45–48, 57–58. ISBN 978-0-19-972029-3. , Quote: "Clearly, the interaction of Buddhism with psychology exhibits aspects of both detraditionalization and demythologization as already described. In addition, the legitimacy that is granted Buddhism in its reconstrual as a kind of psychology reverberates back to the very conception of Buddhism among Buddhists themselves, (...)"